Learning Is “Egg”cellent Even for the “Egg”spert | Tag... you're it! For the past few springs in our district our Elementary Science Coordinator @tkmotley attempts to provide every elementary classroom K-5 a “live animal” for the life science curriculum. In first grade this means “chicks.” Yes, the furry, yellow, cheeping kind. However, the “chicks” don’t come chirping. Our students, district-wide, get the thrill of waiting 21 days and learning about the developmental process along the way before the the little yellow chirpers break from their protective white shell. The “potential chicks,” or eggs, are kept in an incubator in each campus’ library. A live U-Stream video through a webcam is set up so that parents, students and teachers can monitor the progress 24/7. Along the way the first grade students research, learn and develop an understanding of this animal’s life-cycle. In the past they relied on safe research databases like NetTrekker, books and other resources for the majority of their information. This year, however, some of the campuses wanted to bring in an outside expert, a poultry science major. Now for some finding this type of expert might seem daunting, but not me. You see, I know one personally. This wasn’t just any expert, this one happened to be my very own husband. We met while attending the University of Arkansas. We actually worked together for income, while in college, at a poultry research facility ran by the College of Poultry Sciences at the University of Arkansas. So this Poultry Science Major, my husband, coaxed by me, agreed to a Skype session with 6 first grade classes at one of the elementary campuses I support as an Instructional Technology Coach. I have done other Skype sessions for a variety of purposes with a variety of experts. So it started off as just another session to transform learning for the teachers and students I support. The session was perfection. 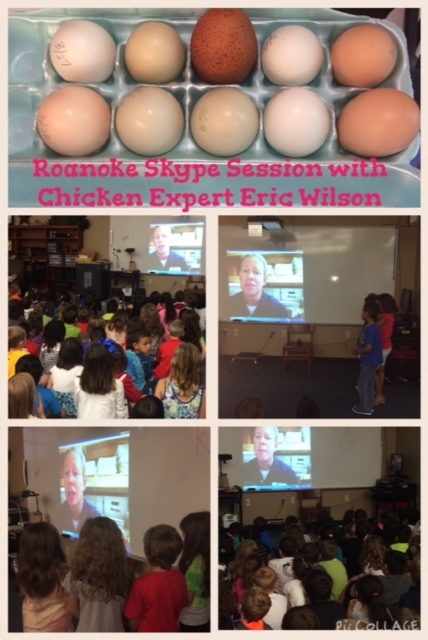 My husband, Eric, shared with them his knowledge of egg hatching and chickens, the process, specific technical terms beyond their own need-to-know academic vocabulary, and graciously answered all of their questions with the right amount of detail and specificity a first grader should have. He carefully addressed the questions of morbidity and shared statistics of viability, without a single child becoming upset. When it was all said and done, the teachers were ecstatic, the students were buzzing with new information, and my husband was grinning a big dopey grin. Later, once I was home, we talked about the event. He was thrilled. Mind you he hasn’t been near any kind of poultry in over 15 years and presently works in a plant the produces confections (candy) of all kinds. However, today he was the “Egg”spert for over 100 first graders and his knowledge was valued. What I learned from this is that often the expert for any event like this receives just as much as the students with which the knowledge is being shared. Connecting real world people to our classrooms is not just needed for the students, it is invaluable to those we invite to share their knowledge with us. Connecting one another on a global level, connects us not just through knowledge but through our humanity. On a side note… Eric plans to connect with two classrooms, maybe more… and he cannot wait. How are you connecting your classrooms with the world… or better yet how are you sharing with the world the opportunity to connect with your learners?